Throughout the Organic movement, health is described as a process, not a state: more than just the absence of disease. But what do Organic Health Concepts mean for the quality of products or the health of the wider ecosystem? How can we measure health in organic food systems? 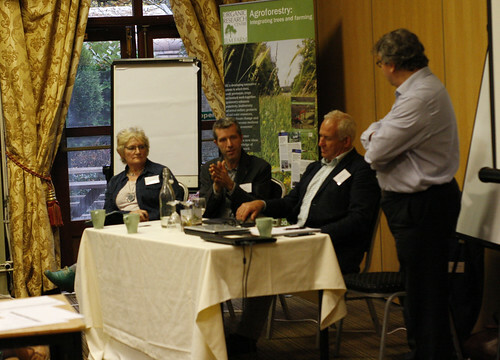 Chaired by Lynda Brown (Demeter UK, Biodynamic Association Certification) with James Campbell (Garden Organic), Sophie Kirk (Soil Association),Will Pouget (The Vaults and Garden Cafe) and Steve Thomson (Garden Organic). Expanding access to, and engagement with the benefis of organic food for people and the environment is a huge opportunity post-Brexit. Three approaches to achieve this are outlined in the Organic Action Plan: public procurement; home & community gardens food production; and eating out. Anja Vieweger (Organic Research Centre) Farming for health - How do farmers approach health? All farmers agree that a healthy soil underpins any enterprise. The activity inherent in a healthy soil makes nutrients available in a balanced way and the microflora and fauna influence the activity and give the soil its characteristics including its ‘vital force’, acknowledged by the pioneers of organics and now science today is beginning to link the microbiota of the soil with the microbiota of the gut. Soil health can be assessed on site by smell and feel and in the laboratory by testing for macro and micro elements. Several companies provide a parcel of measures that are useful indicators of the soil micro flora and fauna which are contributing to soil activity, but the cheapest proxy for soil biomass is mycorrhizae analysis. An organic farmer needs an active soil, the pH of which is in the range for the enterprise and which is not compacted. The land should be farmed using common sense and according to the limits placed by the locality. There are no quick fixes and in organic agriculture a system will often shift itself back into balance. There are key practices to improving soil health all of which will build resilience and enable the soil to cope with occasional insults. Diversity within the soil and above the soil is key. Livestock are a vital component in the maintenance of fertility as are diverse cover crops and leys. If crops are growing vigorously, animals are growing and reproducing and staff are well trained and happy then healthy food will follow. Healthy soils promote healthy crops which promote healthy animals, healthy consumers and landscapes. Soil health and activity underpins the health of every enterprise, monitor but don’t react needlessly concentrate on building an active soil biology and stable humus. A Healthy soils underpin agriculture - manage soils for biology and humus and eliminate agrochemicals which damage the soils and cause major imbalances.